CURTIS CARE: Our Curtis Care Program ensures a trouble-free operation throughout the life of your equipment. We do this through our network of Curtis Trained and Certified Independent Service Technicians. PRODUCT DETAILS: Wilbur Curtis Thermal Dispenser Air Pot, 2.2L S.S. 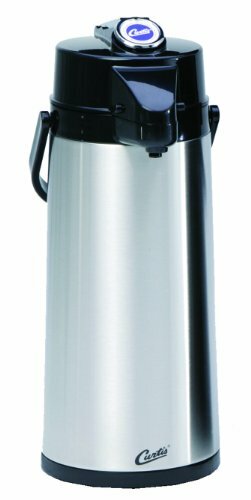 Body S.S. Liner Lever Pump - Commercial Airpot Pourpot Beverage Dispenser - TLXA2201S000 (Each). Brew-thru top keeps heat and flavor in with stainless steel liner for commercial durability. This airpot coffee dispenser is easy to carry and transport. ThermoPro dispensers are compatible with many different brewing systems. By brewing directly into the server, coffee flavor and temperature is kept at its optimum. Advanced interior airpot lining helps keep beverage hot. By brewing directly into the server, coffee flavor and temperature is kept at its optimum. This commercial beverage dispenser and airpot is popular in fine restaurants, hotels and other food service locations. ThermoPro dispensers are compatible with many different brewing systems. By brewing directly into the server, coffee flavor and temperature is kept at its optimum. Advanced interior airpot lining helps keep beverage hot. Wilbur Curtis is the preferred beverage equipment provider of restaurants, hotels and other commercial food service establishments. Its products are designed to meet the durability and performance needs of food service professionals. Popular choice because this commercial airpot dispenser keeps beverages hot and fresh.